I remember picking up Jona from daycare one day when he was around 2, and all the little kids were picking up toys and putting them away in their bins. Like a lot of things he learned at daycare, it blew my mind a little that he was already old enough to start picking up after himself. After spending so much time picking up after many hours of "Let's Dump Everything Out", his favorite game, it was a revelation to think that he could actually be doing that himself. So as Jona got older, we started giving him more responsibilities that were appropriate for his age. It started out with just things like picking up toys and putting his laundry in the laundry basket, but now his chores include feeding our dog and putting silverware on the table. He's a helper by nature, so he loves having little jobs that he is responsible for. Since we've been asking him to do these small chores every day, I wanted to give him a chart so that he would have even more ownership over these tasks. I used this month's $10 at Target to buy a simple dry erase board and some magnets, and set to making an easy chore chart. 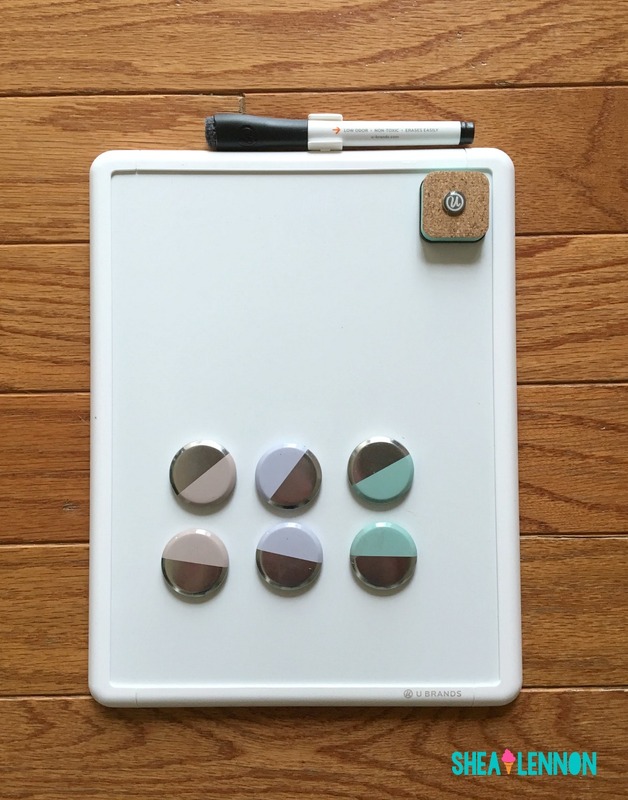 I used a small dry erase board and a set of simple circle magnets to make the chart. The total cost was $10. 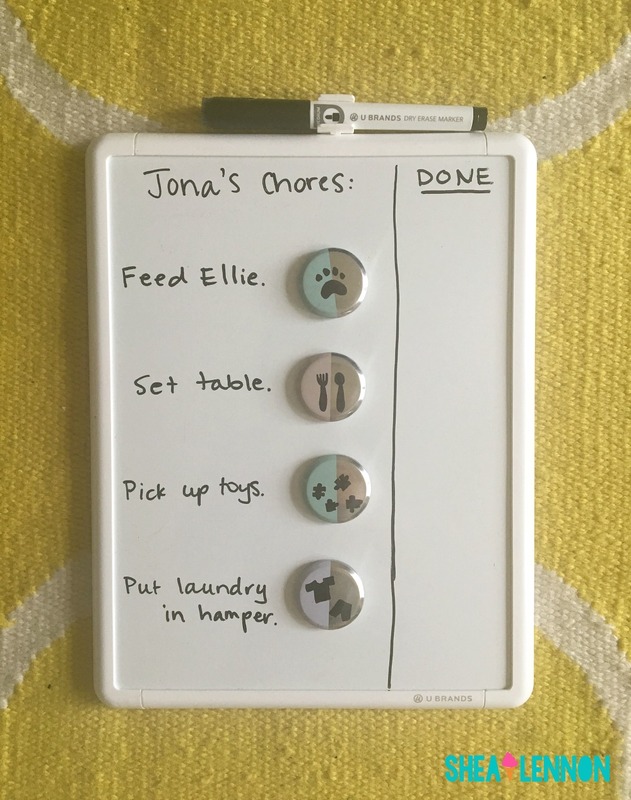 Jona has four chores that we ask him to do every day: feed Ellie, our dog, get silverware for the table at dinner, pick up his toys before bedtime (which we usually help with), and put his dirty clothes in the hamper. With the dry erase marker, I drew a line down the board, about 2/3 of the way across, and labeled it "done". Using a sharpie, I drew pictures on the magnets to represent each chore. Jona can't yet read, so having a picture clue helps him to understand what each chore is. I also wrote them on the board since he can recognize letters--I want him to start making those connections between letters and words. When he does a chore each day, he moves the magnet into the "done" column. At this point, we're not giving him a reward for doing the chores. We may do an allowance when he gets a little older, but for now I think simply moving over the magnet gives him satisfaction. This has been kind of a rough year for Jona, with getting a sister and starting preschool, so I'm trying to find things in his life that he can control when there's so much around him that he can't. We play up the chores like they're things big kids do and tell him he's a great helper; there aren't consequences if he doesn't do them. Again, that's something that may change as he's older, but for now we want him to want to help out. I would love to hear about how you handle chores at your house, or what you did when you were growing up. If you have any good ideas let me know! 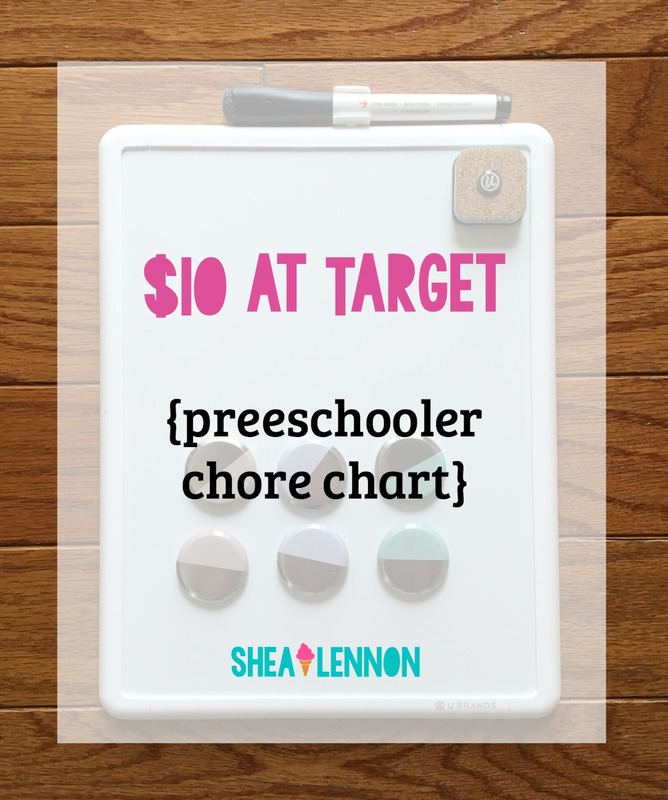 Sharing on $10 at Target. This is such a neat idea, and what a worthwhile item to spend the 10 on. That's so sweet that he's a helper by nature, I'm glad this gives him some joy! I had a similar revelation when C was picking up the toys in the church nursery one Sunday. She has her good days and bad days for cleaning, of course, but she's pretty good at knowing when she wants to switch activities she has to put the first one away. She also has to take her dishes to the sink when she's been excused from the table. We're working on getting her to "sweep" and "dust" and "make her bed" but those are more for the habit than actually being a help!